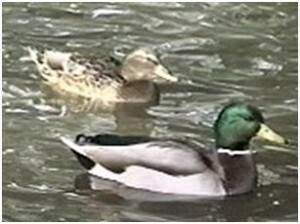 Take your class on a field trip to discover life at the pond in this Canadian Educational Video. Designed for Grades Kindergarten through to Grade 4 this Educational Video Program follows the antics of a 9-year-old boy and his 6-year-old sister as they discover what animals live in a pond, pond vegetation, wetland plants, pond organisms, microscopic pond life, pond life food chain and the important role ponds play in the overall Canadian environment and ecology. This colourful educational DVD is easy for young students to follow and includes captions for specific words for reinforcement. Students visit a pond and learn the important role pond life plays within Canada's environment and ecology. 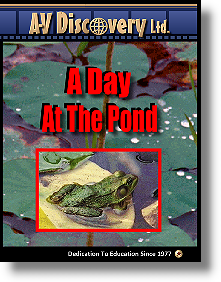 Both children narrate throughout this educational video as they use a variety of home-made tools to inspect pond life, pond organisms and plant life. They explain how they fashioned their tools and how they use them. A beautiful original music score accompanies this enjoyable and easy to understand educational video. Film footage is exceptional including a kingfisher sequence, how frogs grow from eggs to tadpoles, a snake, minnows, water gliders, insects, ducks, lily pads and many other pond plants and other pond life animals. Select this A Day At The Pond link to view the Government of British Columbia Natural Resources website. Select this educational video link to view Government of Ontario Pond and Wetland Informational Website. For complete pricing and catalogue order numbers for the above formats, please view A Day At The Pond educational video in our store, or call us at 1-800-221-9788, fax us at 1-888-796-1796 or fill out the contact form below and we can provide pricing for your needs. If you need a home use only DVD please contact us for pricing details.